Helpful Information About Sleep, Mattresses and Bedding Products. : Metal bed frrames built extra heavy duty. Metal bed frrames built extra heavy duty. The Monster Bed Frame™ is hands down the strongest bed frame available. Nicknamed "The Monster" for its scary strength, this heavy-duty bed frame can support a tremendous amount of weight. The secret is in the frame's TWO inch side rails. They literally double the strength of the frame! The Monster™ is a 5 in 1 bed frame. It will adapt to any size of bedding including California King. Are you ready to put The Monster™ under your bed? Click here to buy the Monster bed frame. The Ultima™ Bed Frame is America's original, and still most popular one size fits all bed frame. 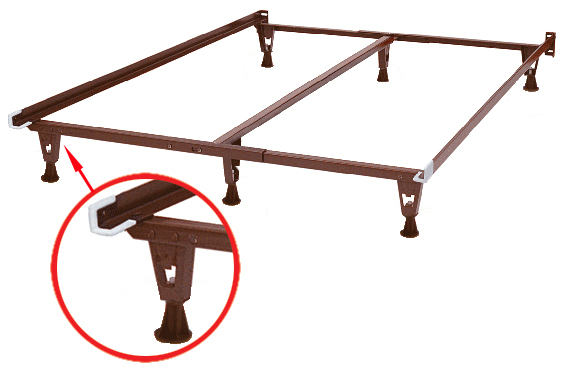 This deluxe bed frame is built from high carbon rail track steel. It features heavy-duty angle iron, pedestal style legs and deluxe rug rollers. The frame also features a dual beam center support which will accommodate every size of bedding; twin through king. The Rock™ is also a heavy-duty 3 in 1 bed frame. It will accommodate twin, full, and queen sized bedding. This deluxe bed frame features a solid vertical center support that adapts in all three sizes; twin, full, and queen. The Rock™ features pedestal style legs with heavy duty glides. This frame is excellent for hard wood floors. All three models listed above are built by Knickerbocker. Knickerbocker is America’s premier manufacturer of bed frames, mattress foundations, and support systems for wood beds. We are a fourth generation family owned and operated company in business since 1919. Knickerbocker remains the only bed frame supplier committed to manufacturing all of our products here in the United States.